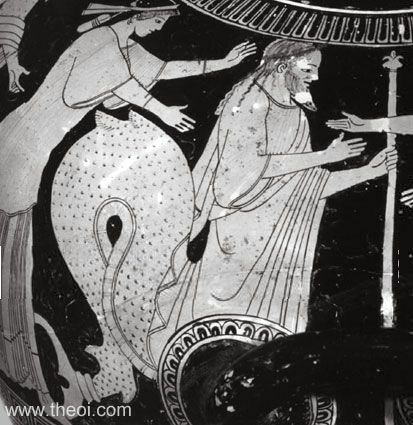 Detail of Nereus from a painting depicting Peleus' capture of the Nereid Thetis. The god has the upper body of an elderly man and the tail of a serpentine fish in place of legs. He wears a chiton and holds a royal sceptre in one hand. A pair of Nereid-nymphs rush towards him with arms outstretched.